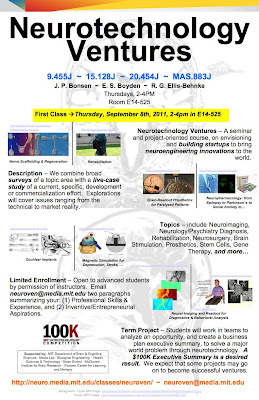 My MIT colleague Ed Boyden and I (with Rutledge Ellis-Behnke in Germany) are again hosting our Neurotechnology Ventures class this Fall at the Media Lab starting Thursday afternoon 8 September 2011 from 2-4pm. This course is all about envisioning, planning, and building startups (both entrepreneurial and intrapreneurial) to bring neuroengineering innovations to the world. Compelling venture themes include Neuroimaging, Neuromarketing, Neurology/Psychiatry Screening & Diagnosis, Mood & Behavioral Influencing, Rehabilitation, Neurosurgery, Neuropharmacology, Brain Stimulation, Prosthetics, Sensory and Motor Augmentation, Regenerative Neuromedicine, Learning, Memory & Cognitive Influencing, and more. Dutch Cycling Embassy ~ Sharing Know-How! Mindshare ~ What's Seducing American Eyeballs? Zeebl ~ MIT Alumco's Mobile 3D Copy Machine! TRSF ~ MIT Tech Review on Speculative Futures! MIT Energy Experiments ~ Campus as Living Lab! Diverse Visitors ~ Feedjit Serves Up Flagscape!